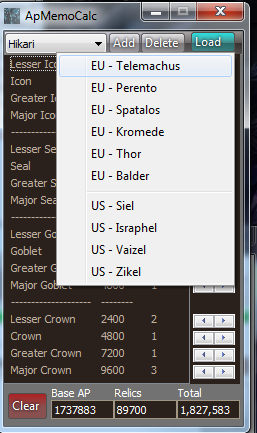 – Added a window to input and edit your character names. This is needed to restrict in-game commands to your own typing , and also helps damage parsing with certain skills like Summon Whirlwind, some damage shields and others (to identify your hits). – You can now copy in-game commands to clipboard rather than having to type them out in group etc, just type it, select the text and copy/cut to clipboard, and ARM will catch it and process the requested operation just as if you’d pressed enter instead. – Added AP Relics tool. You can keep track of all your characters’ AP and relics in this window. You can also retrieve the current AP amount from the website with a button click (for english and german servers). 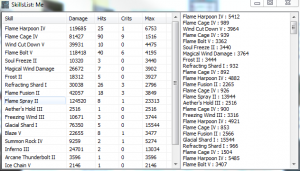 – Added a damage/dps profiler to test different skill rotations or w/e. – Added a button to hide the main window; only the button will remain then on the screen, faded, click it to bring the main window back. – Added a setting for switching “Always on top”. – Added items database to show the names in the chat window rather than the previous item number ids. – Major changes to the UI, though mostly testing colors and sizes for the player boxes. Click on the player name and damage text to open skills/copy data. – Player boxes will change color and and “push” down while actively doing dps. Pushed = actively dpsing; just coloured = recently active. – Added splash screen and changed about window picture. – Some changes and fixes to damage and dps metering. – Made siege times window centered on the screeen. – Added a “blues/golds” counter. Type “#b” in game to increase b, “#g” for golds. 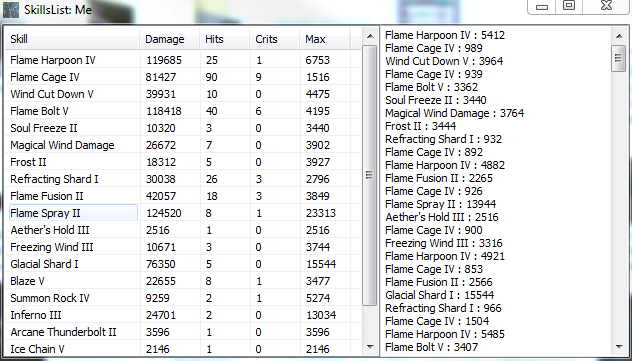 – Added “copy all” option in the menu for damage/dps, as well as clearing options for both damage and AP separately. – Added mouse scroll functionality to players area. – Worked a little bit on the UI, adding some menus and simplifying the basic look. – DPS metering has been extensively altered. 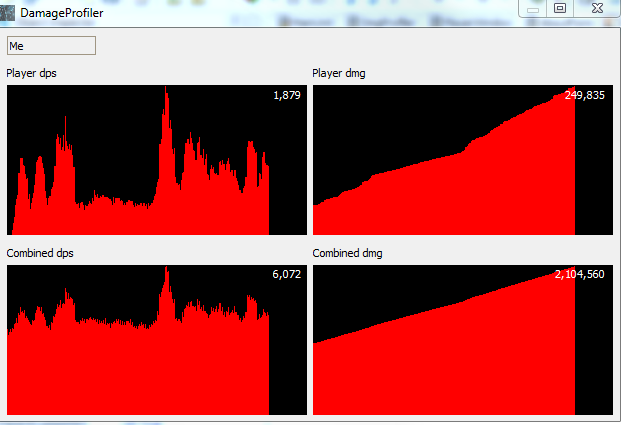 The parser now takes into account the player class to determine more realistic data. Taken into account now are factors like the delays while switching to next mobs, recognizing current mob has died, more accurate expected delays between skills depending on the class, amongst other changes to reflect a more realistic dps for every class. – Session files are now stored under appdata/Aion Rainmeter/Sessions by default. – Session files are now encrypted and compressed when saved. – Added an option to run a new instance. – Chat/Whispers etc will be automatically saved. When you run the program again, it will remember the text from last time you closed it. 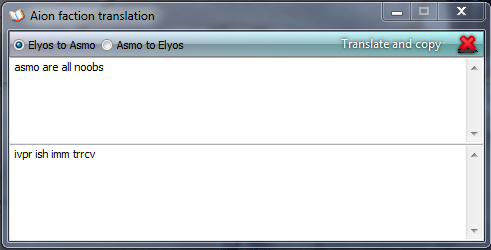 – Chat text is now trimmed to the last 1000 lines (older chat is not saved either). You can disable this. 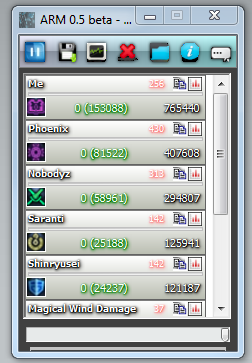 – Added some features in the menu: freeze chat, clear all chat, save chat, re-locate chatlog file, open sessions folder. – Added a tool in the menu: siege times. This will open a small image in a window with the current sieging times. – “Player” ban list: some names are now automatically blocked from being parsed, like Dux, Stormwing and such. In a next version you will be able to edit this list and add players or restrict the metering to your own group (both temporal and permanent “blocks”). – Added an option: “siege mode”. With this enabled, some hits will not be registered, like some dots, pets, servants, godstone hits, all the data that can be easily mixed up by the same class hitting a unique mob, which would severely alter the damage giving false dmg to some players. 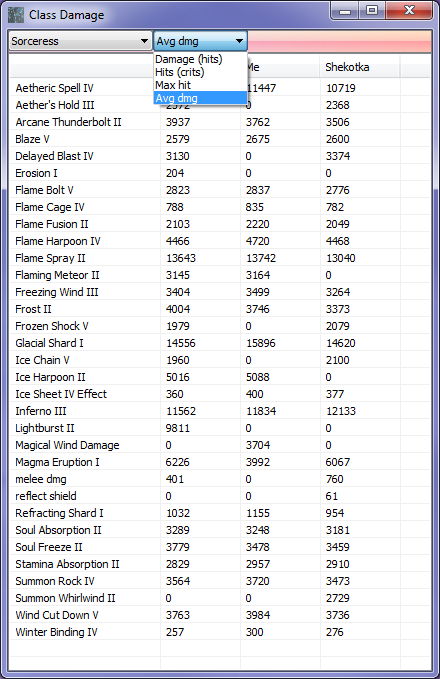 Some dmg will be missed with this enabled, but it will more accurately reflect everyone’s dps. – Fixed an issue with sin’s Venom and sorc’s Wind Cut Down dot. – Made the window on-top again by default. 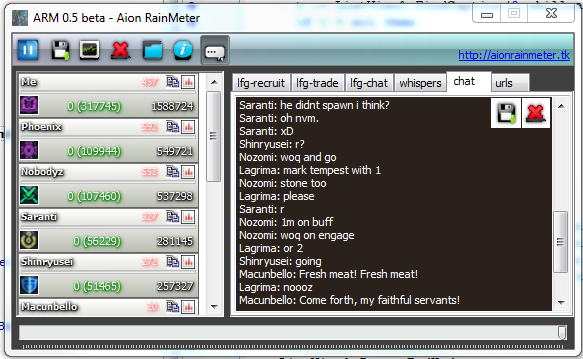 (to see it over your Aion client, you can’t use Full Screen (but windowed full screen works). – Added some missing data in the session logs. – Damage done by your own reflect/shield is now identified as such (showed up as “melee dmg” before). 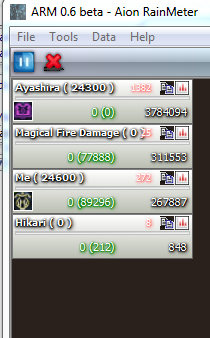 – Average and current DPS now show up.